WEST PALM BEACH, Fla. – Ineria Hudnell was one of a kind in West Palm Beach. Well into her nineties, she kept close to the vest all of West Palm Beach’s black history. Known as the foremost historian of black history in the city, she died on Aug. 8 at the age of 97. Her health had declined over the past several years. Hudnell’s exhibits and artifacts of the county’s black history were well documented in her traveling museum that was filled with black and white photos dating back to the 1800’s. She absolutely loved chronicling the data, documents, and photos of the area’s black life, said her only child, Earl Hudnell, 71. “This is what she loved doing. This brought her the greatest joy,” said Earl in a telephone interview. Her exhibit includes a prized photo of the Styx, the all black shantytown that was on the wealthy island of Palm Beach until it was reportedly burned to the ground by whites. The photo dates back to the 1800’s. “When I started this, I couldn’t stop. And I’m still going with it,” Hudnell said in April 2009. She said it was because she believed God had a plan for her so she was carrying out the plan. “She believed in what she did. And she believed in the history of blacks in Palm Beach County,” said her son. Hudnell’s desire for a permanent home for her massive exhibit resulted in the African American Research Library and Cultural Center of Palm Beach County placing the artifacts at the old Roosevelt High School where she once taught. An asbestos problem forced the removal of the exhibit, which is now in Earl Hudnell’s home. Earl said the Community Redevelopment Agency (CRA) and the African American Research Library and Cultural Center are working on finding a place. “This collection is so valuable and important because it helps to define who we are and ensures in history the many contributions we made to make Palm Beach County the great place it is. Our legacy as a people will be passed along for generations to come,” said Barbara CareyShuler of Shuler’s Memorial Chapel. Hudnell’s former colleagues and students say she was well suited for her task as caretaker of the city’s history. The art and English teacher was meticulous and highly organized and precise with everything – including her coiffed hair and clothing, said Samuel Bruce McDonald, 90. He first met Hudnell in 1946 after she’d taught a year in Gifford, Florida before moving to the Palm Beaches. Hudness and McDonald had storied careers as teachers and administrators for decades, touching the lives of most blacks who grew up and went to school in West Palm Beach in the 40’s, 50’s and 60’s. 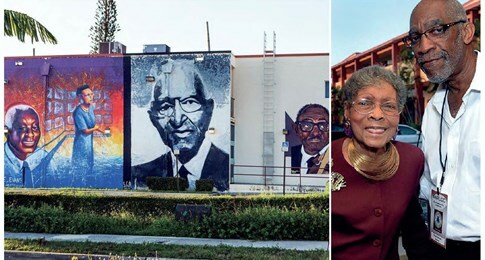 They are both featured on a mural on Tamarind Avenue in the heart of West Palm Beach’s black community. “We had a mutual admiration for each other,” said McDonald, who was only a senior in high school when he met her. Later, he became a faculty member with her at the segregated, historic Roosevelt High. “God gave us a gift of humanity when He gave us Ineria Hudnell. She was always such a beautiful and pleasant lady. She was so giving,” he said. “I used to tell her that we needed to collaborate with her exhibit. She had the photographs and because I’m from here, I had the narrative. I admired her greatly,” McDonald said. Dan Calloway, another stalwart in the community, said he knew Hudnell about as well as anyone. He met her when he was just nine years old. Eventually, she was his English teacher at Roosevelt High. “What I liked about her so much is she never gave up on us. She and Mr. McDonald were my most amazing teachers. Her dress, her hair was always in place….and that baritone voice. She was beautiful with that smile,” said Calloway, who has a sports complex named after him in Riviera Beach. “She has been honored so many times, and she always wants me to introduce her.” He and McDonald will speak at her memorial service. “I’m honored to do that,” Calloway said. Ineria E. Hadley Hudnell hailed from Jacksonville, Florida and graduated from Florida A & M University in 1943. In addition to her son, Earl, she is survived by four grandchildren, 10 great grands and six great, great grands. Her body was donated to the University of Miami for research. A memorial service is set for Sept. 8 at 11 a.m. at Tabernacle Missionary Baptist Church in West Palm Beach.